The Lake Sturgeon (Acipenser fulvescens) is a member of the Sturgeon (Acipenseridae) family. As a group, sturgeons are considered living fossils, and have changed little from their ancestors of the Devonian Period. The Lake Sturgeon is the only freshwater species of sturgeon in Canadian waters and is the largest freshwater fish in Canada. Across Canada, the Lake Sturgeon has been dramatically impacted by human activities. Separated into eight units, they have been assessed at various levels of risk by the Committee on the Status of Endangered Species in Canada ( COSEWIC) . Each unit is currently under consideration for listing under the Species at Risk Act. The Nipissing First Nation (NFN) Natural Resources Department undertook a multi-year project that was intended to fill significant information gaps on the status of Lake Nipissing sturgeon. Historically, Lake Sturgeon dominated the Lake Nipissing ecosystem, however, decades of overfishing has diminished this once flourishing species. Presently, the quality and quantity of the remaining sturgeon species is unknown. In an effort to understand the population status and habitat needs, in an earlier phase of this project NFN began compiling Aboriginal traditional knowledge (ATK). Additionally, NFN used radio-telemetry, juvenile and adult tagging and habitat mapping to develop a comprehensive and definitive report on the population and habitat status of Lake Sturgeon in Lake Nipissing. The ultimate goal of this project was to use the information gained to develop a conservation plan that will protect and enhance the Lake Nipissing sturgeon species. The Algonquin communities of Kitcisakik, Lac Simon and Long Point First Nation joined forces in 2010-2011 for the protection of species at risk. The protection of the Woodland Caribou herd in southern Val-d'Or and the protection of Lake Sturgeon in the upper watershed of the Ottawa River were the focus of their concerns and recovery activities. Education, information sharing, knowledge acquisition and data collection were the main drive of the project. PartnershIPS with Université du Québec en Abitibi-Témiscamingue and the Ministère des Ressources Naturelles et de la Faune have enabled the communities to combine traditional and scientific knowledge. The visual and interactive communication tools developed and shared have supported cooperation with the local population, full process integration and the participation of community members in finding solutions. The lake sturgeon has been important to humans for many centuries. The Native Americans relied on them for food, oil, and leather. The fish has a shark-like appearance but no teeth, feeding on worms, leeches, larvae and small fish. It can grow as large as 185 kilograms (400 pounds) to a maximum recorded age of 154 years. The lake sturgeon were a valuable resource for native Indians and early European settlers who used the fish as a source of smoked meat and oils. More recently, people have harvested many of the sturgeon species, including lake sturgeon, for caviar. Sturgeon are an ancient fish that date back to the age of the dinosaurs. They are a cartilaginous (nearly boneless) fish with a sucker-like mouth, shark-like tail, sensitive barbels (whiskers) under the snout, and bony scutes (plates) along the sides and top of its body. They are opportunistic feeders, meaning they feed on almost anything they can find, with a diet consisting primarily of invertebrates, insect larvae, crayfish, worms and mollusks. Size, weight and lifespan vary from species to species. Most sturgeon are amphidronous, meaning they travel up freshwater rivers briefly to spawn, then return to the saltwater of the lower river and river estuaries for the remainder of the year. Of the 27 living species found worldwide the lake sturgeon is one of only a few that spends its entire life in fresh water. The sturgeon is known as the king of fishes. A primitive fish that has probably existed on the earth since around the time the dinosaurs disappeared, the sturgeon comes in a variety of sizes, but can reach twelve-foot lengths and at least 300-pound weights. Sturgeons were considered the royalty of fishes among the Native people who lived in the Great Lakes area. In the Ojibwa nation there is a Sturgeon clan that is one of the teaching clans. To the Ojibwa people the sturgeon represents depth and strength. Native Americans thought the sturgeons were a delicacy because they had extremely meaty flesh. Instead of eating the meat immediately, they would dry it out and cook or preserve it through a smoking process. Several species of sturgeon are considered threatened with extinction as a result of over-fishing, poaching, water pollution, damming and destruction of natural watercourses and habitats. There are 25 species of sturgeons and all are among the most endangered fishes in the world. Although records suggest that sturgeon have been important to humans for 1000’s of years. “isinglass” from the swim bladders for making glue and paint for teepees. Sturgeon harvesting activities also created a valuable cultural meeting place as many different first nations congregated in the spring at sturgeon spawning sites to share in the harvest. Some traditional sturgeon spawning sites have been used by first nations for over 3000 years. Early settlers considered sturgeon a nuisance fish when caught in their nets set for more desirable fish like walleye and whitefish. The sturgeon were discarded, or sometimes fed to pigs or used as fertilizer. 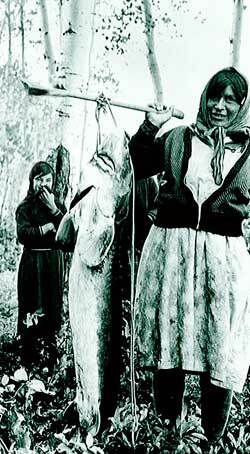 Because they were rich in oil, discarded sturgeon were stacked on shore like cordwood and burned to fuel steamboats. With the onset of the caviar fishery attitudes towards the sturgeon changed. Sturgeon became the most valuable commercial freshwater fish in North America. Lake sturgeon have been harvested by humans in the Moose River Basin for thousands of years. Lake sturgeon had both cultural and subsistence importance to Aboriginal peoples. All parts of the fish were used: the meat for food; the skin as a container to store oil; the isinglass which lines the swim bladder as a paint stabilizer; and the pointed bones along the back as arrow heads. Today, lake sturgeon remain culturally significant and continue to be a valued food source to Aboriginal people. Initially, early settlers did not value lake sturgeon but soon learned about its various uses. Anglers and commercial fishers targeted lake sturgeon mainly for its popular smoked flesh. The oil was used in paint manufacturing and the isinglass from its swim bladder as a clarifying agent in beer and wine. Leather products were made from its skin and the eggs were used for caviar. By the early 1900s, such uses of lake sturgeon led to large increases in its harvest. Historical harvest records are incomplete. From the limited data available, it’s clear annual harvests exceeded a river’s production of fish in some years (Figure 3). This means more fish were taken from a population than the population was able to produce. the lake sturgeon that live in at least 128 lakes and reservoirs and 101 rivers across Ontario (as well as sturgeon in parts of Quebec and Manitoba) represent “the last, good remaining stock of pristine sturgeon anywhere in the world.” They are, in other words, possibly the final hope for one of the oldest and most beleaguered groups of animals on the planet. If lake sturgeon are a living link to our primeval past, they certainly look the part. Lead grey or deep, primordial brown, adult sturgeon appear to belong to another time. Their skin is without scales and leathery, and their fins set back toward their sickle-like tail. Mature sturgeon are huge, frequently a metre or more long. Some are giants, reaching a length of four and a half metres and weighing up to 185 kilograms (the weight of a small piano). Despite their size, lake sturgeon inhabit the relative shallows (between five and 10 metres deep) where they patiently scour the bottom, using four sensory barbels hanging near their noses to locate insect larvae, snails, crayfish, clams and sometimes small fish. Like sharks and other ancient fish, sturgeon have a skeleton of cartilage instead of bone and move with an almost fluid gracefulness. Also like sharks, these prehistoric fish have a long snout, and their eyes are eerily black. “The first European settlers hated them,” says John Casselman, an adjunct professor at Queen’s University and a former senior scientist at MNR’s Glenora Fisheries Station near Picton. Before the mid-19th century, vast numbers of sturgeon swam in the clear water of the Great Lakes and its undammed tributaries, and were despised for fouling nets and gear set for trout and other, more useful species. (The settlers’ view of sturgeon was in sharp contrast to the centuries-old beliefs of many Ontario First Nations people, who revered it as a source of food, oil and leather, and celebrated it in rituals and legends.) Fishermen stacked “nuisance” sturgeon onshore by the thousands and left them to dry, later to be used as furnace fuel for steamships. In the 1860s, that negative attitude changed. Canneries appeared in the United States that could process sturgeon meat for markets elsewhere, and caviar became a sought-after delicacy. A huge commercial sturgeon fishery boomed throughout the Great Lakes, as well as in other large Ontario waters such as lakes Nipissing, Nipigon and Simcoe, Lake of the Woods and the Ottawa River. More than seven million kilograms of sturgeon were harvested in Ontario at the peak of the fishery between 1885 and 1889. Then, with spectacular suddenness, stocks collapsed. In the period from 1905 to 1909, the catch fell to less than one-tenth of what it had been 20 years earlier. The fish live up to 150 years, and females can take 33 years to become sexually mature. Even then, they spawn only every four to nine years. (Males mature somewhat earlier and spawn about twice as frequently.) As well, the potential mothers remain in spawning condition for only a short time, and they reabsorb their eggs if no suitable sites on which to deposit them are available. While dams have been clearly linked in the past to reductions in sturgeon populations, including the collapse of sturgeon stocks in Lake St. Francis (which has dams at both ends) and declines on parts of the heavily developed Ottawa River, they’re not the only pressures on lake sturgeon. Climate change may warm some waters above the cool temperatures spawn need to hatch, and water pollution threatens to poison the eggs. Invasive sea lamprey prey on adult sturgeon, but efforts to control the lamprey are proving to be hazardous to sturgeon as well: the chemical used to kill young lamprey in streams can also affect the struggling fry of sturgeon. While invading mussels and gobies are a source of food for sturgeon, gobies also eat sturgeon eggs and mussels cover and spoil the pebbly spawn beds. Nevertheless, dams are of most concern, if only because of the very real potential that the problem is about to get much worse. Although sturgeon have difficulty climbing dam “fish ladders,” such as those used in the United States and Quebec to help eels, other possible mitigation methods include managing downstream, sturgeon-friendly water levels, flows and habitat; physically trapping and transporting the fish past the barriers; or simply choosing to locate projects on other rivers, where their effects will be less disruptive to sturgeon.